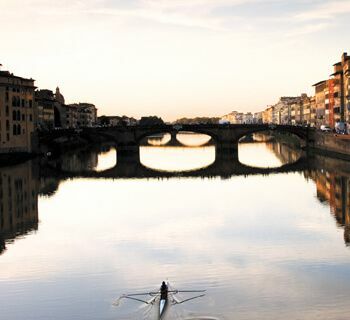 Florence offers a unique mix of ancient history and a thriving modern metropolis. Known as Italy’s Renaissance City, it’s famously associated with the 15th century artists of Michelangelo, Botticelli and Leonardo da Vinci and is the ideal base to explore the surrounding countryside in Tuscany. At Azure, our luxury holidays in Florence provide top class accommodation, delicious cuisine and plenty of unforgettable experiences. 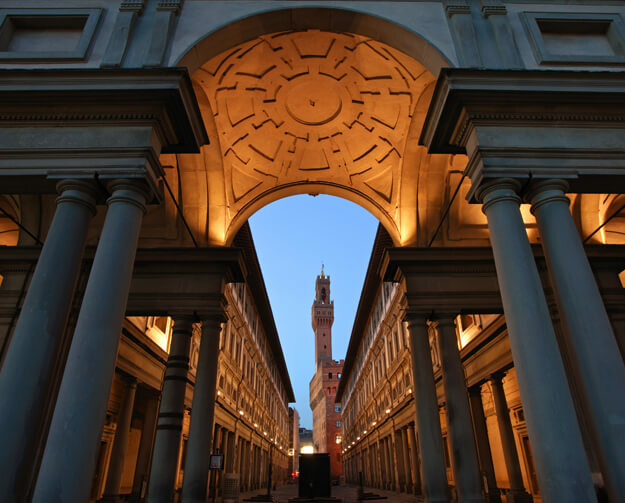 Florence contains an abundance of stunning art and architecture, and much of it remains unchanged since the Renaissance. Wander narrow streets to marvel at the elegant 15th and 16th-century palaces, medieval chapels and churches decorated with ornate frescoes. There are a variety of world-class art museums in the city, where you can find paintings by Botticelli, Michelangelo and other great Italian artists. The Duomo is Florence’s most iconic landmark with its distinctive red-tiled cupola that took over 150 years to complete. The fine restaurants and luxury hotels in Florence offer dishes made from locally-sourced products. Sustainability is important to the Florentines, with fresh vegetables, fruit and meat produced in ways that have minimum impact on the environment. The city has a wide range of places to sample the cuisine, from fine dining eateries with top Tuscan chefs to family-run food trucks selling local delicacies such as tripe panino. Slow food is a tradition in the region, so eat like the locals and take your time over your meal. The hills that surround Florence contain many vineyards that produce quality local wine - the perfect accompaniment to your meal. When you want a change of scenery, escape the bustle of the city and explore the beautiful landscapes of the Tuscany region. The countryside offers some of Italy’s most picture-perfect scenery, including gently rolling hills, cypress avenues, golden wheat fields, olive groves and vineyards. Many of these areas grow produce that make up the ingredients for the simple but delicious Tuscan food. Tuscany is a wonderful place to explore on foot, in an open-top car or by bicycle. A typical night out in Florence starts with a cocktail in one of the sophisticated bars. You’ll also find a selection of intimate clubs and live music venues where you can enjoy drinks and dancing. The Auditorium FLOG has an eclectic mix of film, world music, live gigs and DJ sessions. For something a little different, head to the Sala Vanni to listen to some jazz music. 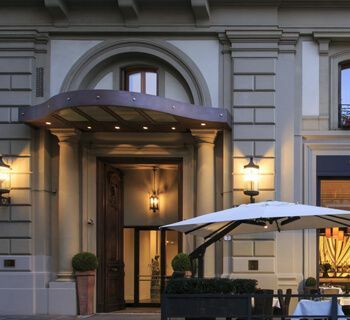 Our selection of 5 star hotels in Florence have been handpicked for their outstanding style, service and food. Whether you’re looking for a family-friendly holiday or a romantic getaway, we offer a range of tailor-made packages to suit your individual needs and desires. To find out more, don’t hesitate to get in contact with Azure today. Our friendly and helpful team are just a phone call away and will be more than happy to answer any queries you may have about our holidays and help you create the perfect itinerary. 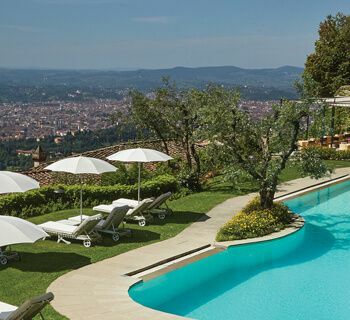 A mere 15 minutes away from the delights of Florence, Belmond Villa San Michele is nestled among the Tuscan hills, affording stunning views over the local landscape. 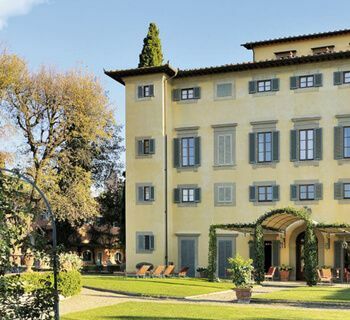 Originally a 15th century monastery, this boutique hotel has been thriving since the 1980s, and its stunning façade is attributed to Michelangelo himself. 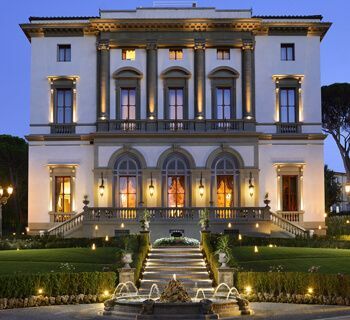 Offering a selection of lavish suites and rooms, Belmond Villa San Michele channels the opulence of a bygone era with sumptuous fabrics, beautiful marble bathrooms and lush gardens to explore. 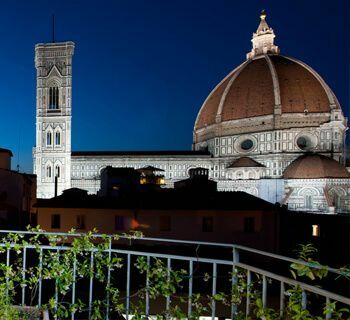 Hotel Brunelleschi occupies an enviable position right in the heart of the breathtakingly beautiful city of Florence. Just steps away from the Duomo, what was once a medieval church with a circular Byzantine tower is now a sumptuous boutique hotel that has its own small museum showcasing the building's history. 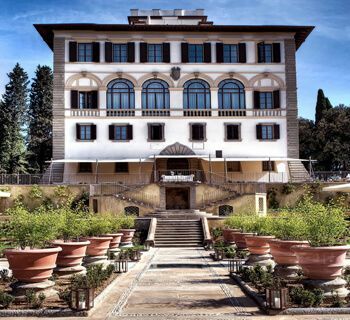 Tucked away in a beautiful private courtyard, Hotel Brunelleschi offers guests the unique experience of feeling pampered in a serene and secluded retreat, while having the architectural and cultural delights of Florence right on their doorstep. Refurbished in 2017, there has never been a better time to stay at the wonderful Hotel Lungarno. 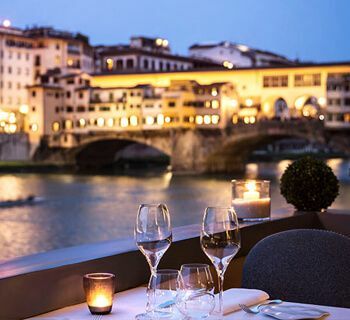 Perched on the river Arno with the stunning Ponte Vecchio in the background, a nautical theme of cool whites and marine blues infuses the décor of the hotel.